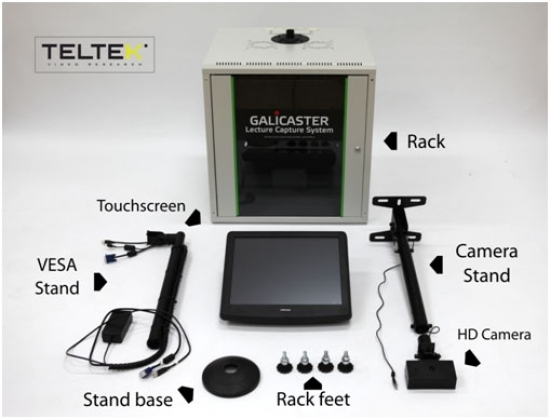 What is Galicaster Classroom KIT (GaliClass-KIT)? 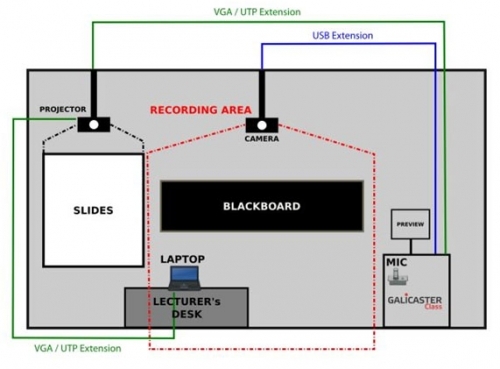 GaliClass-KIT is a complete set of hardware including all you need to set up a classroom ready for recording lectures. The KIT includes 1 Galicaster RACK unit and a complete Accesories Package (ClassAccPACK) including: HD-USB ceiling camera with its stand, rack unit, touchscreen stand and wireless microphone. The rack should be installed on the floor and solidly secured, away from usual audience paths. It is typically placed at one side of the board, on a convenient location near a power supply and a network socket. The recording unit (Galicaster RACK) should be placed inside the rack and connected to the building’s computer network using an appropiate Ethernet cable. 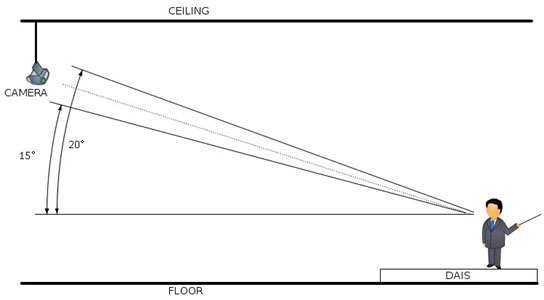 The optimal camera position is typically about 5m ahead of the wall – the one being recorded- but this also depends on the board size, that should fit in the scene completely.